4 OUR EXPECTATIONS? An Opinion It's important that you read this article. Yes, you Chicano. Who else? History: According to Dean Hubbard, the Student Senate passed a resolution in 1967 that created the off-wing of the EOP department, or SSS here at the University of Iowa. However, in the resolution there was either the word "Black" or "minority" and with this in mind the EOP recruited 90% or higher, Blacks between the years 1968-1970. EOP was not sure whether they could or should recruit Chicanos. Blacks? Yes. However, somewhere in the 10% came Antonio Zavala and Rusty Barcelo, who together made Phil Jones see that minority also meant Chicano students. That year --197-71- Jones was persuaded to recruit some Chicano students. Now with the aid of Antonio and Rusty, between 1971 and the fall of 1973 Chicanos have increased from around 20 and approximately 80 Chicano students. Not bad? Check this. Between 1968 and 1970 there were hardly any Chicano students on this campus from in or out-of-state. Why? Because SSS didn't care? Could it also be because there was no Chicano culture to be found? Well, let's proceed. Now, how many Blacks are here at the University of Iowa? Approximately 300 that are funded and recruited through EOP-SSS. Did I say 300? That's right, carnal. Now listen--read--this. 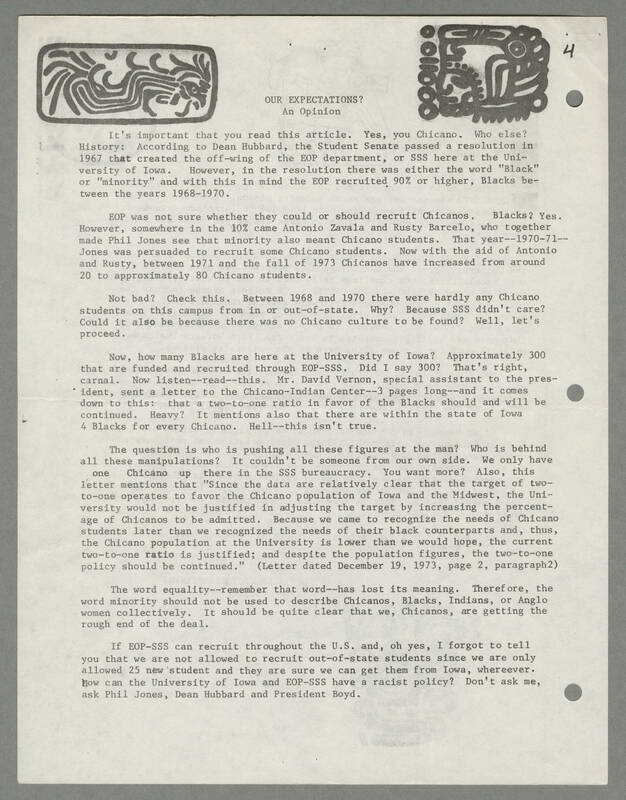 Mr. David Vernon, special assistant to the president, sent a letter to the Chicano-Indian Center--3 pages long--and it comes down to this: that a two-to-one ratio in favor of the Blacks should and will be continued. Heavy? It mentions also that there are within the state of Iowa 4 Blacks for every Chicano. Hell--this isn't true. The question is who is pushing all these figures at the man? Who is behind all these manipulations? It couldn't be someone from our own side. We only have one Chicano up there in the SSS bureaucracy. You want more? Also, this letter mentions that "Since the data are relatively clear that the target of two-to-one operates to favor the Chicano population of Iowa and the Midwest, the University would not be justified in adjusting the target by increasing the percentage of Chicanos to be admitted. Because we came to recognize the needs of Chicano students later than we recognized the needs of their black counterparts and, thus, the Chicano population at the University is lower than we would hope, the current two-to-one ratio is justified; and despite the population figures, the two-to-one policy should be continued." (Letter dated December 19, 1973, page 2, paragraph2) The word equality--remember that word--has lost its meaning. Therefore, the word minority should not be used to describe Chicanos, Blacks, Indians, or Anglo women collectively. It should be quite clear that we, Chicanos, are getting the rough end of the deal. If EOP-SSS can recruit throughout the U.S. and, oh yes, I forgot to tell you that we are not allowed to recruit out-of-state students since we are only allowed 25 new student and they are sure we can get them from Iowa, wherever. How can the University of Iowa and the EOP-SSS have a racist policy? Don't ask me, ask Phil Jones, Dean Hubbard and President Boyd.